What does discipline, self-control, courtesy and respect for others – oh, and huge amounts of fun - have to do with shooting? Welcome to the world of 1066 Target Sports. Brain-child of former soldier and competition shooter Jason Byrne, 1066 Target Sports opened its doors last summer and is enjoying success as the the most comprehensive indoor target sports centre in the UK. The family run business located in the beautiful town of Hastings, East Sussex, has had over 3000 customers to date and has enjoyed a meteoric rise, already being voted Hastings Top Attraction (TripAdvisor). Following Britain's shooting success in London 2012, one of 1066 Target Sports primary goals is to further promote the sport and de-myth the public perception of target shooting, enlightening people to the many benefits and personal developments that can be gained through such a disciplined sport. Jason and the staff are passionate about target sports and the benefits that they can bring to body and mind. Target shooting is one of the few sporting activities in which able bodied, disabled, young and old can take part and compete on an even playing field. Working closely with disabled groups, youth groups, schools, and care homes, they have been awarded a World Host recognition for exceptional customer services, and they strive to provide a welcoming facility which can cater for all levels and abilities. Built to competition standards, the gallery is a key training / leisure facility open to shooting enthusiasts, local clubs, youth groups and the general public alike. 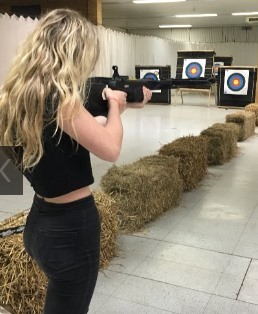 Providing safe and responsible sports practices and principles for all target shooters, the facility is able to deliver this to a diverse variety of ages and abilities. 1066 Target Sports is laid out over 28,000 sq.ft offering an easily accessible, warm, dry, secure and well lit environment which is staffed with highly skilled and qualified instructors. Ideally suited for the tourism market, 1066 Target Sports was part funded by East Sussex County Council and further supported by Hastings Borough Council with ongoing staff training and development. With the ability to offer corporate activities/team building events, group bookings and have-a-go experience packages as well as standard lane and equipment hire, 1066 Target Sports is proving to be an resounding success with customers. Recently featured on ITV Meridian News, and with support from noted local personalities such as Amber Rudd MP Hastings and Rye, local parliamentary candidate Sarah Owen and Bruce Dowling current Mayor of Hastings, all encouraging this enterprising new business.